I really love calendars. There are so many unique ones out there! I know there are plenty of calendar round-ups out there but I thought I'd do my own because it was a lot of fun finding calendars ;) Still time to order these for the new year! My favorites are #6 and #10 ! Calendars are so exciting, aren't they?! Love #3!! Seriously- you make everything look good. the stump calendar isn't available on anthro any more but you can still buy it here! thanxs for sharing!!!! i love number 6! My boyfriend and I always love the moment when we choose our calendars (we need two). We take hours in shops to find the more «special one», so do I really have to say how much I love your selection in this post? My favorite one (I think - because their all stunning) is the 8 (season wall). Oh my goodness these are SO cute! Especially love the coffee mug one. Well done. My favorite is your coffee-cup calendar...SO cute and creative! Love, love, love these. I'm obsessed with beautiful calendars too. Oh my! So many lovely calendars! With those how could I ever possibly forget the date ^-^ If I were to pick a favorite, I guess it would that cafe latte calendar! Stunning calendars. Seriously the collection of calendars are fabulous. 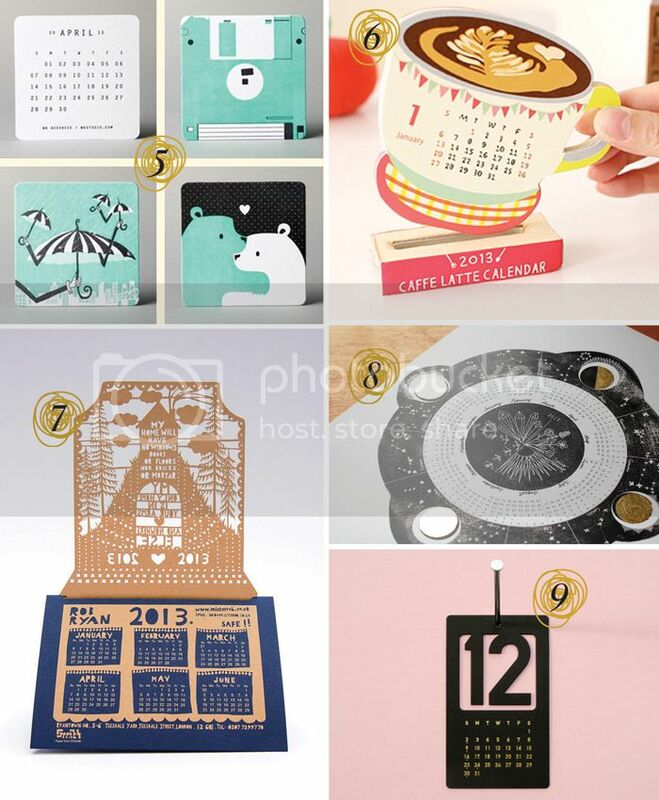 I was just searching this types of calendars which I want to be hang on my wall or put on the desk. I just want new things for my room & the new year is best time to replace all of them. 10 out of 10 I want to give. Thanks for sharing! it give me the urge to create my own calendar... will try!